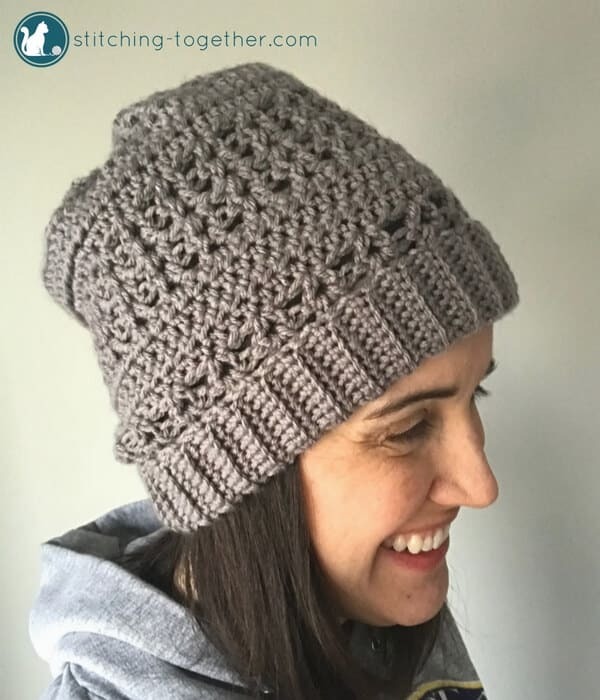 Below you will find a free crochet pattern for the Coco Crochet Slouchy Hat. 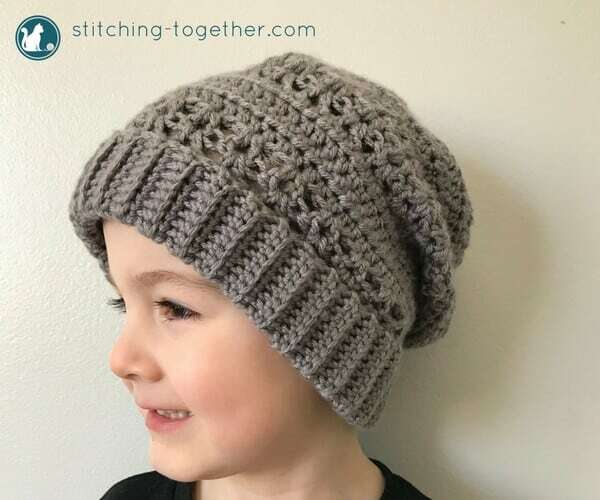 A combination of simple stitches gives the hat great texture and a unique design. The hat is first constructed as a rectangle – there is no working in the round. 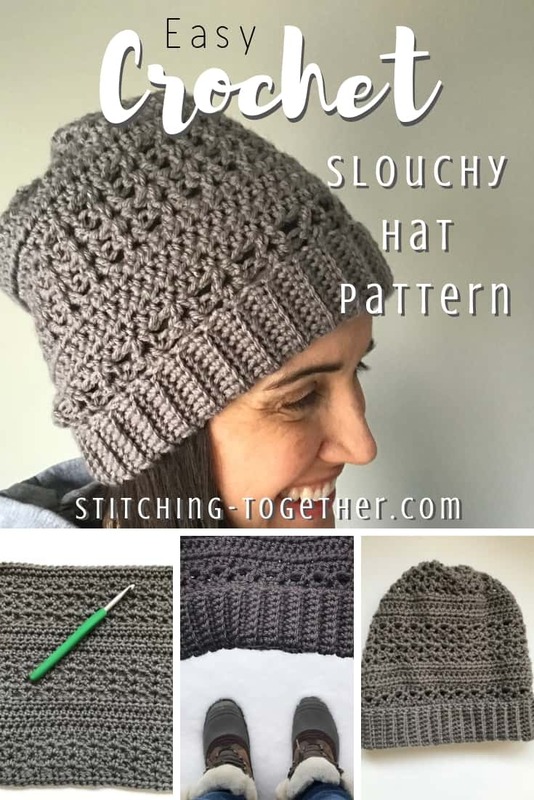 If you have been wanting to crochet a slouchy hat, this is a great place to start! Do you know what the great thing about making your own stuff is? It’s randomly glancing at the lost and found table at bible study, noticing an adorable crochet slouchy hat, and realizing, without a doubt, it’s yours. Whelp, that explains why I couldn’t find it. 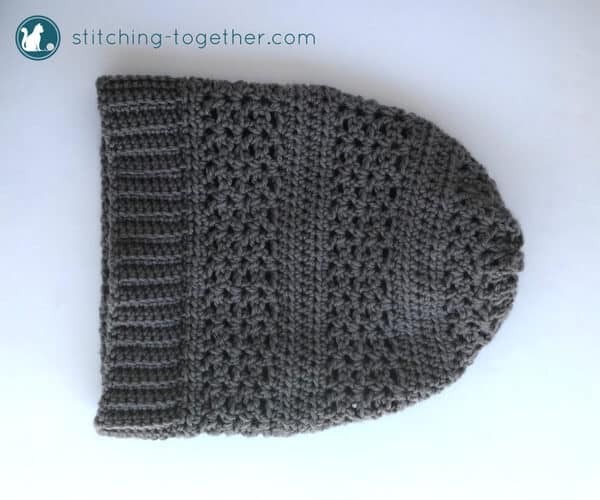 This hat does have a lot of stretch, so you can use the ear warmer size chart as a guide but you may want to use the smaller measurements in your chosen range if you are using the same yarn. The open v-stitches with half double crochets give this hat it’s unique look. 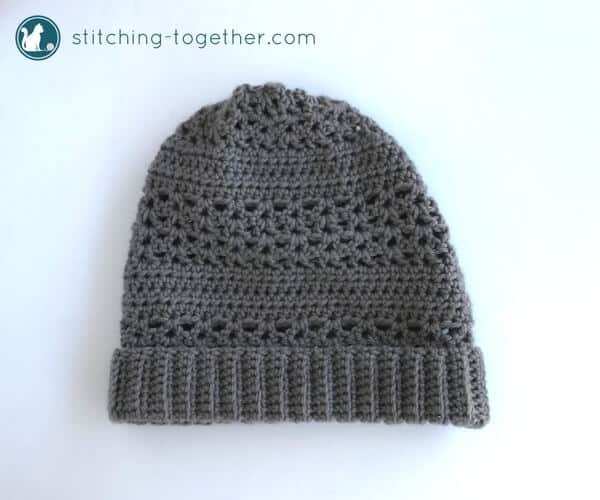 Since there are more open stitches, it won’t be a super warm winter hat or stand up to strong wind but it’s perfect for cooler weather like late fall and early spring. The hat is first worked as a rectangle. Once the rectangle is complete, it is folded in half and sewn together. 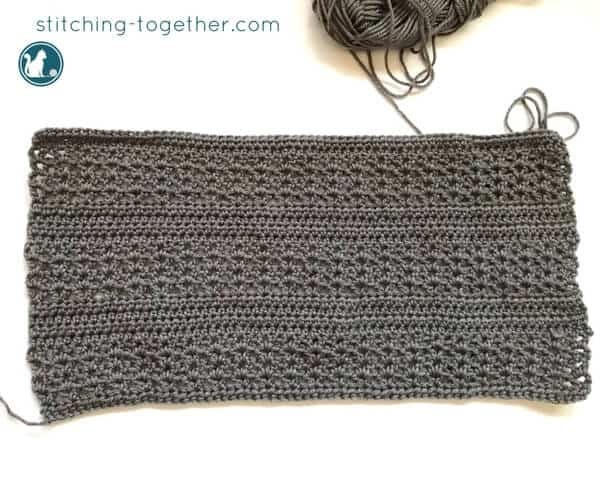 Do not bind off – continue to complete the ribbing. Row 2: sc in the BL of each sc. Turn. Fold the rectangle in half and sew the seam together to form a tube. Weave yarn through the hdcs at the top of the hat. Pull gently as you weave through the hdcs to cinch to top of the hat closed. Bind off and weave in any ends. Please tag me on social using #stitchingtog if you make this. I love seeing your finished patterns! Thank you. I purchased 3 skeins of yarn to make hats for my daughter, mother and myself. I started over with my skein and it works but not with the one my daughter picked for herself after 3 tries. I told her despite choosing the right weight i don’t think it’s going to work with this pattern. I’m willing to try again and make sure I didn’t miss any stitches and see what happens. Ok that helps. So after you ch 3 are you double crocheting in the very first ch-1 sp? It is right at the base of the ch 3. If you skip that first one, it will definitely pull your stitches in. If that’s not it, let me know and we’ll keep brainstorming! I’m confused because as I’m crocheting row 3 my rectangle is beginning to curve. I keep rereading the instructions to double crochet, chain 1, double crochet into each single crochet space but obviously I’m misunderstanding that. Can you help? Hi Eve, is in curving in like you don’t have enough stitches or out like there are too many stitches? Yes, that helps alot – that’s kind of what I thought to do, too. Thanks again, Jess! Hi again, Jess – I am about 11 rows into the ribbing. Right now, the ribbing slants to the left. I’m wondering if I am connecting it correctly. I can manipulate it now, but wondering if by the time I get to the end, if it’ll be wonky. Does this sound right? thank you! Hi Elise, I am not sure about why it is slanting left. I usually get a curve more than a slant I think. 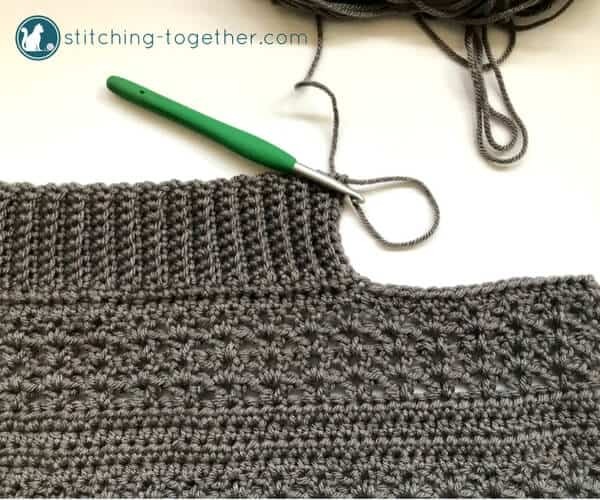 There are a couple of pictures in this post https://www.stitching-together.com/crochet-toddler-cocoon-shrug/ which may be helpful! Hi Jess – thank you for replying. I think I know what I did wrong The instruction that threw me was ‘slip stitch UP TO the next hdc’. I completely read that wrong and was slip stitching IN the next hdc. No matter how long you’ve been crocheting, there’s always something to learn :)Thanks again – hopefully that was my last question. Have a good day! I really like this pattern! How long would the foundation chain be for a 4-5 yearold? Thank you! Hi Elise, I’d make the foundation row about 16″ – just keep it as a multiple of 3 + 1. If you do a chain then you’ll want to do a multiple of 3 and hdc in the second chain from the hook. Thank you so much for getting back to me so quickly! That helps a great deal. This pattern works up so quickly and looks complicated but it is so easy. I love the different textures. I think I’ll be making several :). Thank you for sharing this pattern. Hey again Jess – re: the child’s hat – I’m thinking I should also make less rows, as well? I still want it to be slouchy but that same amount of rows as an adult’s would be really long, correct? Thank you! Yes! I am sorry I didn’t think of that. 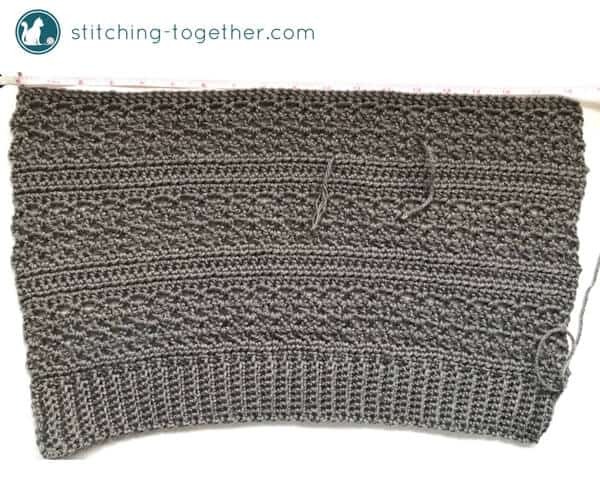 I think it would look best to do one less row in each section of the v-stitch or a couple of rows of the v-stitch part that is covered by the band. Hope that helps! Cute hat and I love how this one is constructed! Hope you see this post! I have to tell you I have become jaded where crochet hats are concerned. SO many hat patterns this season, I’m just tired of seeing them. UNTIL I opened this pattern by accident! I love this hat!!!!! The uniqueness and versatility is something I haven’t seen yet. Thank you Sooo much for not going along with the crowd of other crochet hat designers! Well, Kate, you made my day! Thank you so much for the kind words. 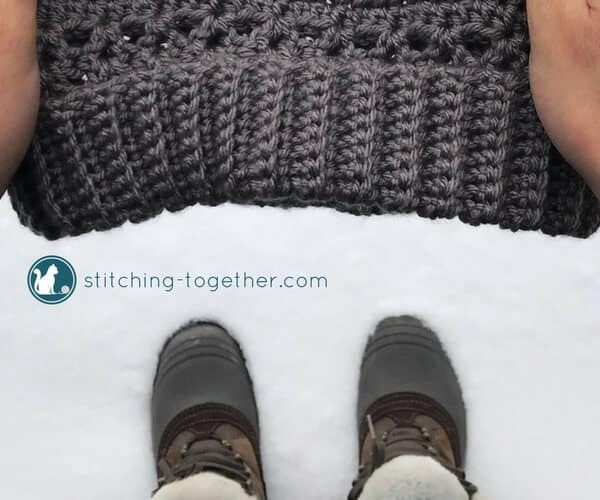 Hi Anna, the pattern starts with a foundation half double crochet row instead of a chain but if you’d like to do a chain, you’d chain 68 and then hdc in the first chain from the hook and in each chain to the end of the row. Nice to know you get the fibers and fit you want too. Great hat and on a snowy day like today very appealing.